I'd like to start by saying no, I don't think my Etsy shop is a huge success...I have a longgg way to go. 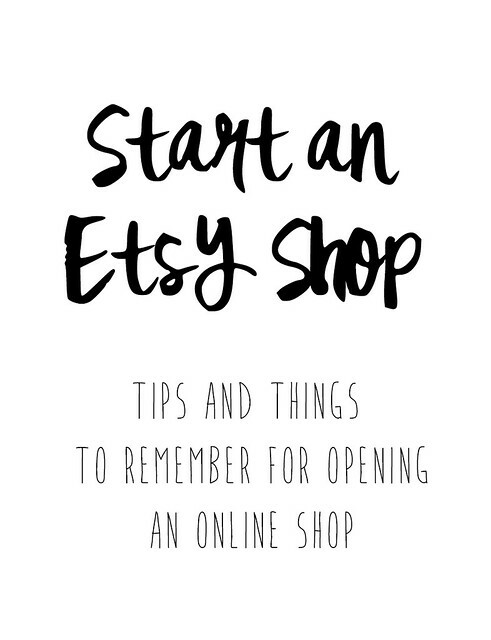 But, I can say that I've done my research on opening an Etsy shop and I have learned a few things that I need to keep in mind going forward, so I thought I would share! My friend Rach is opening a shop very soon and we've been chatting about this sort of thing lately, so here we go! Do your homework. Read books, look up helpful articles, learn from the experience of others. I really recommend How To Sell Your Crafts Online and Craft Inc.
Stay organized. Set up Google Docs to track your inventory, sales, expenses, etc. Update it as you go (little piles of things to update will just stress you out). Get an iPhone. Yep, I'm serious. Apart from the fact that I've a devoted lover of the iPhone (I put my iPhone through the washing machine, and it still works. For real. The warm cycle. )...it also is beyond helpful for an Etsy shop owner. The Etsy App is amazing. You can access your Google Docs so easily, check mail, stay up on Twitter, Facebook, etc. And although I'm sure you've all been really swayed by the "We need tools, not toys" Blackberry commercial, the fact remains, iPhone is better. Have at least 20-25 items to get started. Shops that have too few items get passed over too easily. People like to browse, so if they see your five items and that's all there is, they're just going to keep looking elsewhere. Have something that people will need to have. There are SO many shops on Etsy, you want to have something unique that people can only get from you. Define your customer. Make sure you know your target market, where they have out, and how to reach them. And don't forget Etsy shop owners...I myself always check Etsy before I check a regular store. That's part of the beauty of being in the Etsy community! If you can't take a decent photo, you really shouldn't bother. Once again, no, I don't think I have the most awesome photos, but I try my best. I'm really into white backgrounds, but whatever you chose make sure it's simple, and consistent for all of your products. If I go to an Etsy shop and their pictures are awful, I don't even bother. It matters...a LOT. Give your shop a cute, consistent look. People should be able to easily recognize you throughout all of your various social media spots (Facebook, Twitter, Pinterest, Instagram...the usual), so make sure your Etsy banner and avatar work with your overall look. Don't ignore your packaging. Don't just whip your item into an envelope...think about the details. Labels, tags, whatever you want to use. Make it feel like your customer is opening a present. Who knows, maybe then they will order another one. Think about SEO and make the most of it. If you don't know what SEO is, well put a hold on everything else and start researching it because you need to know about it. This is a good place to start. Confirm your shipping methods and costs before hand. Look into different options and compare prices. Consider what you will charge if your customer buys more than one item. Make use of the shipping profiles that Etsy incorporates. Renew your listings often. This will keep your items at the top of the lists, so it can really increase your traffic. I've heard that it's best to renew roughly between 6:30 pm and 11:00 pm. Be careful when choosing your tags. For example, someone may search for you by name, but they may not have changed the search option to 'Shops'. So, make sure at least one of your items has a tag with your name and your shop's name. Have a blog. I mean, everyone should anyway if you ask me. Have a business plan, and a marketing plan. And use them. Get to know treasuries. Creating them is a big part of being part of the Etsy community. Don't use your own shop in them, but use it as an opportunity to draw attention to your favourites. And make them cool...don't just randomly pick items or search for 'blue' and add the first dozen items that come up. I'm still really new to this part, but you can see the two I've done here. Do something for your shop every day. Whether it be updating your expenses report, posting on your blog, renewing a few listings...do a little something (or a lot of somethings) to keep things moving. Well, that's all for now. As time goes on I'll be sure to share more tips that I come up with. And if you do open a shop, add me to your circle so I can buy things! !